Oakland residents Rickisha and Elgin White came home from work found a pile of rock debris outside their door. Neighbors thought there had been an accident, but it turns out someone came, dumped the trash and left in a hurry. "I don’t expect people to do this type of thing," Elgin White said. 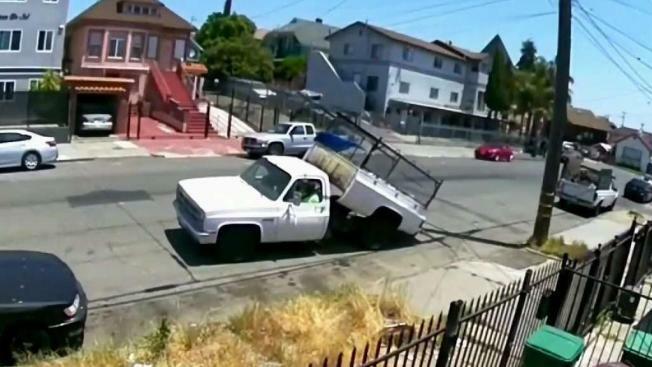 A surveillance footage provided by one neighbor, Tom Larson, showed a white truck stopping on East 17th Street in Oakland Thursday afternoon. "It was very much an illegal dumping there was a conscious thought on doing this in Oakland street. We felt disgust," Larson told NBC Bay Area. He decided to post the footage on Twitter and called on Oakland Mayor Libby Schaaf to do something about it. Mayor Schaaf quickly responded and said she's "outraged" that people think they can dump their trash in someone else's neighborhood. In the past 5 years, illegal dumping complaints in the city have doubled, Schaaf said. Schaaf said the city has increased enforcement and added illegal dumping pick-up crew, "sort of like litter police," in the new city budget. People who find an illegal dump can report it Oakland 311 to get it cleaned up, Schaaf said.